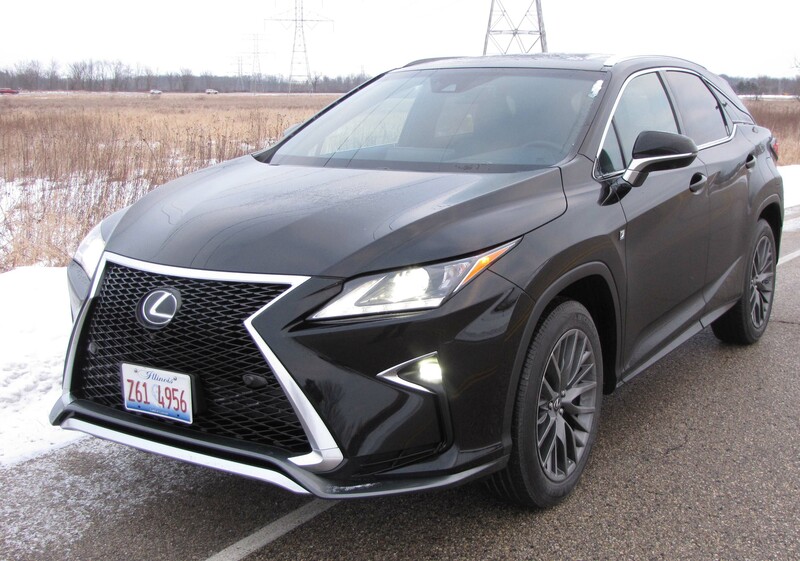 The Lexus RX350 has set the tone for mid-size luxury SUVs, now mostly crossovers, for about 20 years and with the 2016 model being totally restyled inside and out, I was expecting more of the same. That is, I expected to be wowed by the segment leader’s new duds, spangles and spurs. Its sleek lines, low roofline and distinctive wide monster grille give a look that sets it apart in this station-wagony-ute segment. I liked it and colleagues commented on its spiffy looks. 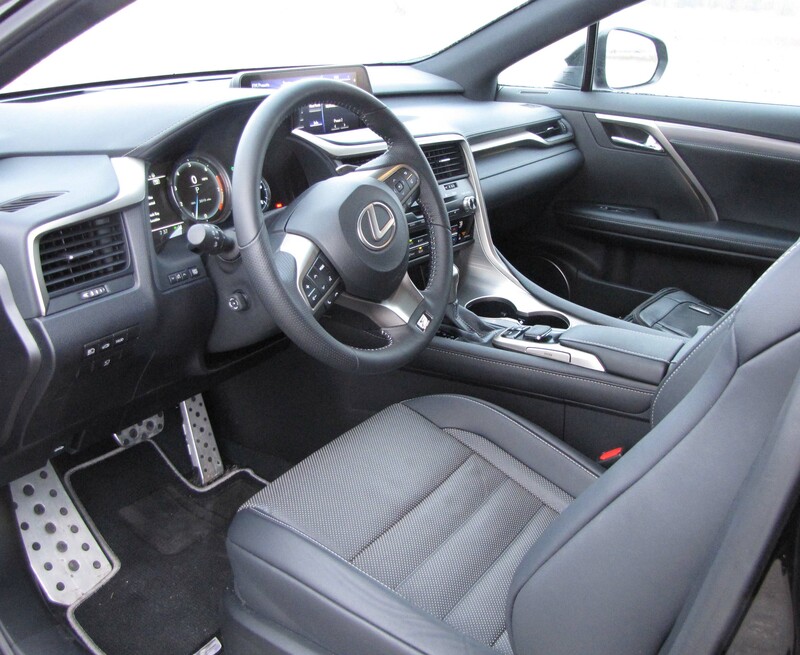 But, at $56 grand and change, I expected more from the metallic black (Obsidian) test model, an F Sport model, which means you get real leather seats, AWD, paddle shifters, variable suspension settings and big ol’ 20-inch wheels. All RX350s come with the same silky 3.5-liter V6 with variable valve timing and are linked to an 8-speed automatic. Only the hybrid models, RX450h, feature a different power plant. That’s a V6 combined with hybrid electric power to create 308 horses and boost fuel mileage from a moderate 19 mpg city and 26 highway in the test model to 28 mpg city and 30 mpg highway. For the record, I got 20.0 mpg in about an even mix of city and highway miles, and only regular gas is required. There’s no disappointment with the power. The V6 creates 295 horses (up from 270 last year), feels strong and shifts are smooth and precise. Handling also is fairly precise and the Sport F gives you a button on the console to go from Normal to Sport or Sport+ mode, each firming the steering and ride and giving you more aggressive shift points. To be honest, Sport didn’t seem much sportier, but Sport+ made a big difference. 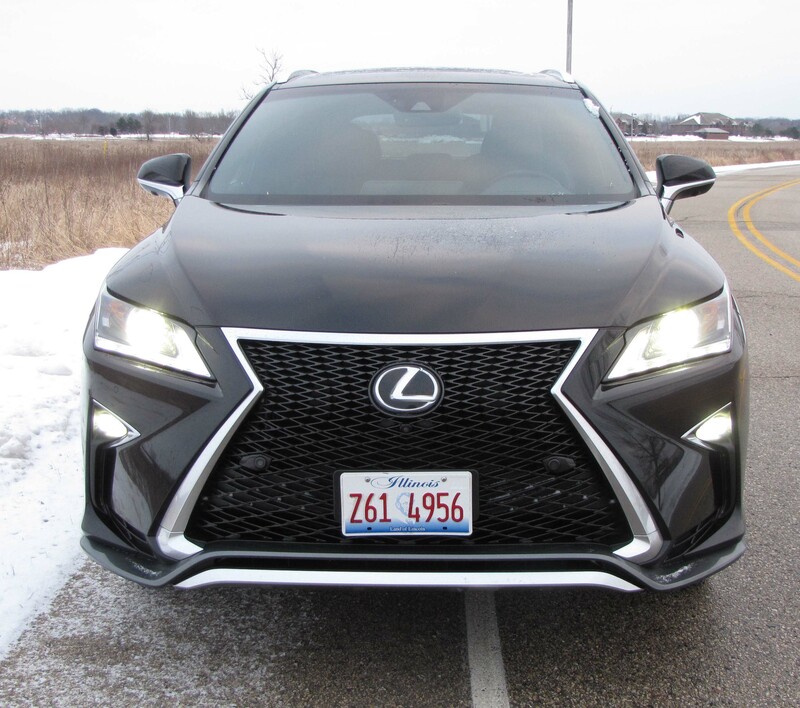 Still, the RX350 has been a luxury soccer mom ride for years and it’s unlikely that Sport+ mode will be used much in the burbs, except when entering a freeway. Plus, you forget it’s there. AWD is standard on the Sport F and is certainly a plus in our climate. My disappointment started with the ride. It’s sportier than you’d expect, which means firmer suspension that passes the bumpy feel of our crumbling roads and highways along to the crossover’s occupants. Too stiff? No, but it’s definitely stiffer than in most mid-size crossovers and sedans these days. If you expect a soft, compliant luxury ride this will likely be more firm than you expect. But here’s what bugged me most in this crossover that started at $49,125 plus a $940 delivery fee. 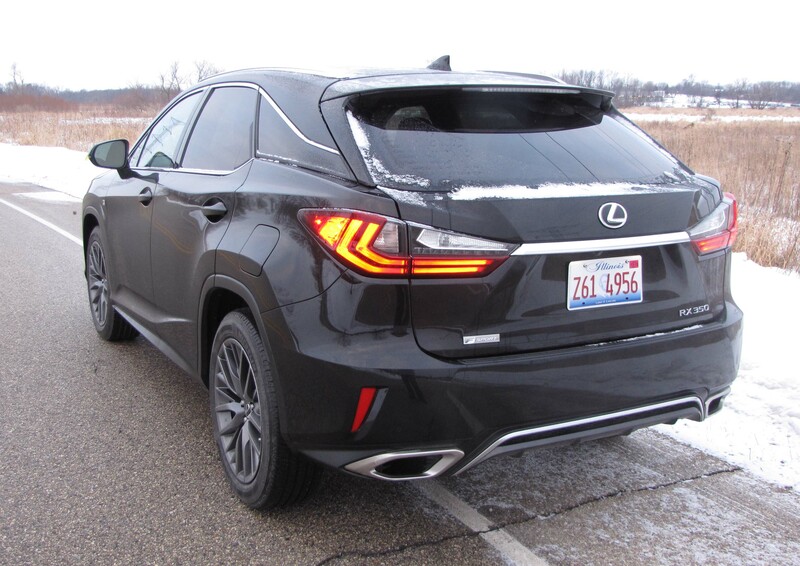 The crossover’s low slopping roofline made entry for this 5-5 driver a pain, plus there are no heated rear seats or a heated steering wheel at this price. Really? I’ve driven $35,000 vehicles with both features. I know this sleek look is attractive, but with the power seats fairly far forward to accommodate my modest-length legs I had to do a bit of a limbo move, tilting my head back awkwardly, to get in without cracking my noggin on the low-slung door frame. Once inside the quiet and attractive RX350, the front seats are quite snug in the hips. I’m no skinny-minnie, but I’m far from the width of an average man who is 6-feet tall or more. If it’s snug for me, it’ll be snug for many. I know this is the F Sport, so no doubt these are racier shaped seats, but they will not sit well with large-bodied drivers or front seat passengers. The rear seats, which could hold three adults, are flatter and more comfortable. On the plus side, the front seats are heated and cooled, with three temp settings, and front seats are powered for both driver and passenger, with power lumbar for the driver and three memory settings. Other standard features include a rearview camera, rain-sensing wipers, fancy 9-speaker audio system with satellite radio, a power tilt/telescope steering wheel and power rear hatch. Rear seats split and fold flat for expanded rear cargo space too. I liked the interior’s look, black leather, including dash and wheel, plus a pewter look trim and textured metallic pattern on the console. But Lexus continues to feature an awkward console-mounted mouse to control the radio and other options on the giant screen atop the dash. That screen is a tremendous 12.3 inches (part of a $2,180 option package), but most of its functions work through the mouse, which does not always stop where you want it to, sometimes jumping down to the radio station below where you initially try to set it. It’s odd too because there are 21 buttons and two knobs on the dash, yet that doesn’t give you any radio presets, just climate controls and other odds and ends. Even cars in the 1950s and ’60s had easier systems. I feel we’re sometimes making dash controls more complex instead of simpler. The test crossover also added a sunroof for $1,100, a color heads-up display for $600, plus a blind-spot monitor with rear cross traffic alert and panoramic view monitor for $1,300. With a few other goodies added the test vehicle settled at $56,845. I can remember when that was expensive. Wait, it Still is expensive. 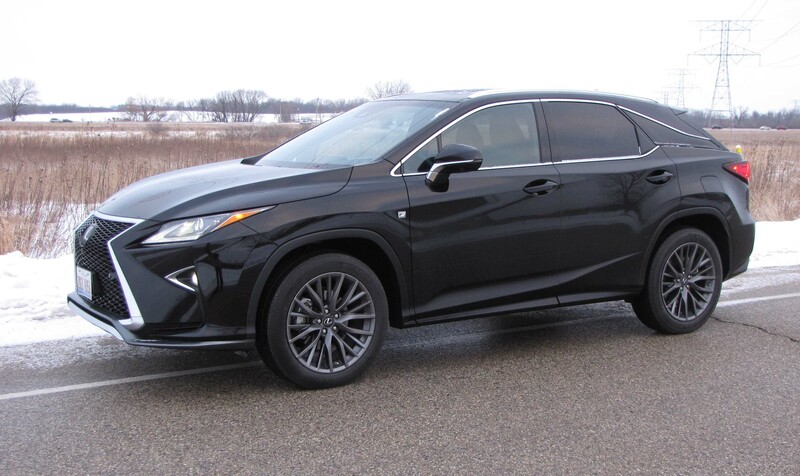 For folks enamored with the Lexus’ snazzy looks, a base model with front-wheel drive starts at $42,840, including delivery, while an AWD model lists at $44,240 with delivery. Those come with 18-inch tires while the F Sport models have 20-inchers. This F Sport AWD was mid-range while a hybrid 450h F Sport will run you $57,985, before adding any options, although in that model many features already are standard. There’s no denying the RX350 has the right prescription for looks, power and handling. But its quirks may limit its appeal more than in previous models. Hits: Powerful, good handling and distinctive looks with wide grille. Quiet, nicely appointed interior with heated/cooled front seats, sunroof, power tilt/telescope steering wheel, giant 12.3-inch screen for nav/radio/info and a power hatch. Misses: Low roof angle makes for difficult headroom for short drivers when entering vehicle, snug seat pockets up front, an awkward console-mounted mouse controls the radio and screen, no radio buttons on dash and no heated steering wheel or heated rear seats at $56 grand, really? Previous PostChicago Auto Show Video TourNext PostWhat’s your dream ride?